Just one week shy of it's first anniversary on October 11 , the Emergency Services Centre saw another round of training on October 3, this time for our Kaslo and Area D ESS team. Assistant Fire Chief Larry Badry (left) and Regional Fire Chief Terry Swan, cutting the ribbon at the opening day ceremony in 2014. In the last year, the centre has seen lots of use. Yesterday (Saturday Oct 3) was another opportunity for local repsonders to gain more skills and share best practices. Many of our local Emergency Social Services team from Kaslo and Area D along with participants from Trail and Nelson, were able to take part in a course re: setting up and running a reception centre, should the need arise. CC Williams from the Justice Institute, came from Kelowna to teach the event. 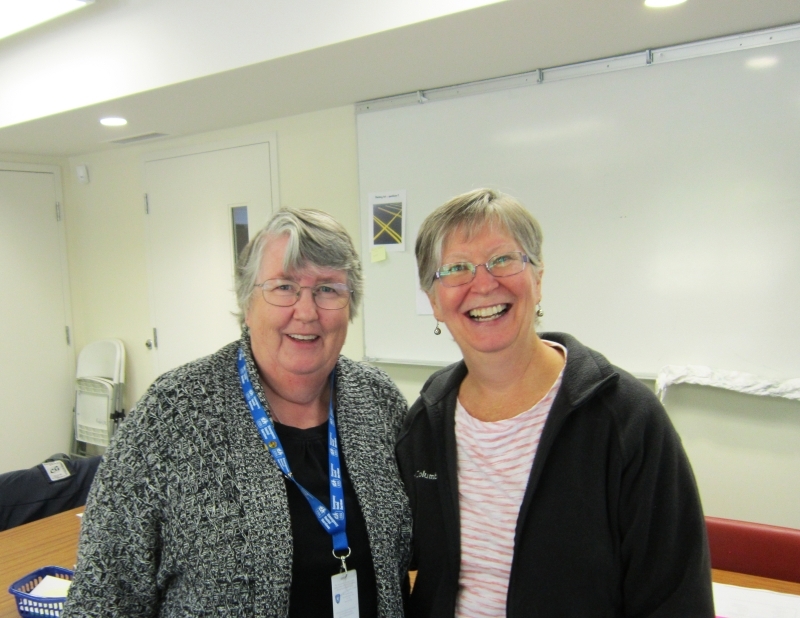 Photo of Catherine Williams (Justice Institute instructor, left) and Maggie Winters, one of our reception centre managers for this area, at training workshop.